My youngest brother, Aidan, was born twelve years after me, almost to the day. It’s well-known, at least within our family, that Aidan never “liked” me when he was younger. It’s hard not to dote on an adorable little brother, but he just wouldn’t let me. As a baby, he would bite and scratch me if I tried to hug him. When I was a senior in high school – all six of us were in the same school building for one year – I would visit his kindergarten classroom and he would go to the corner and turn his back, refusing to look at me while all of the other five year olds wondered aloud how he had such an old sister and sometimes, if I would let them touch my hair. He was six when I left for college. We lived under the same roof again for one year, after I had graduated. I started working full-time as soon as I returned home and was more interested in lamenting being a 22 year-old office drone who didn’t know what she wanted to do with her life living with her parents than figuring out what made my then 10 year-old brother tick. So, what I’m really saying is, I never got to know Aidan all that well. But I think I’m starting to get to know him better. I had the opportunity to spend some time with him this past weekend when I stayed overnight with him while my parents were away. 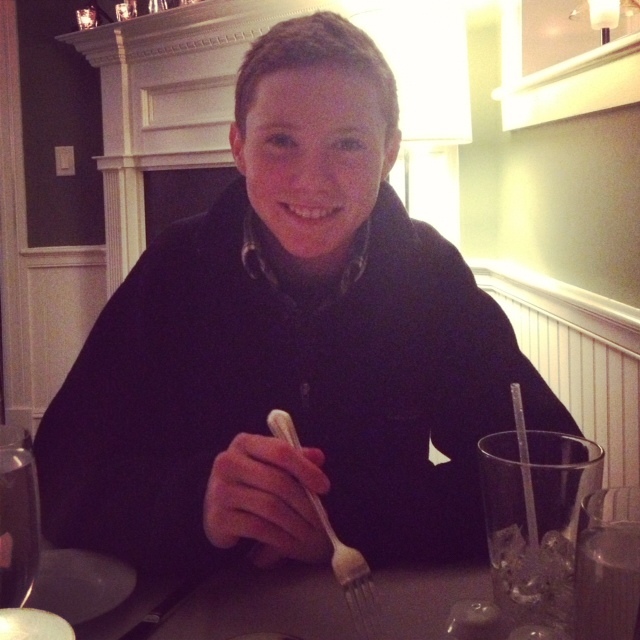 While we were eating dinner out, it hit me all of the sudden that he’s pretty much a young adult. And that was weird but, I guess, kind of delightful at the same time. As an older sister, I’ve always felt obligated to ask my younger, school-aged siblings the boring questions that kids always get asked. All about sports, their classes, etc. Conversation has gotten easier with my younger three siblings as they’ve gotten older and on Friday night, I finally felt like Aidan and I were having a discussion rather than a Q&A session. We talked about the Oscar movies we’d seen and the books we’d been reading. His English class is doing a unit on the Holocaust and I guess I was something of a YA Holocaust literature connoisseur when I was his age, so we had a good discussion about Night and its sequel and some other non-Elie Weisel books. (Aidan, if you’re reading this, read After the War by Carol Matas! That was one of my favorites.) And he tolerated my talking at him about pre-WWII Eastern Europe for longer than was necessary, which I think shows real maturity. After dinner we watched The Grey, which I had been meaning to see for a while and it was only made better by Aidan’s commentary – ‘Do you really think you’re gonna get cell phone service in the middle of Alaska?’ – and the fact that my dog actually climbed up in the chair next to me and watched along with us. Aidan fell asleep with like ten minutes left in the movie so I had to tell him the ending, though I don’t think he really cared. Then I got back into big sister mode and made him get all of his stuff ready for his swim meet the next morning so, we were done being friends for the night. I left the next morning after he’d gone to his meet. A part of me feels like the above might seem boring and sentimental to anyone who doesn’t know me as an oldest sister or know me at all. But I guess the night felt like a turning point to me? Like maybe it marked the beginning of the end of me acting like a third parent. Like now I can be more of a friend to all of my siblings because the distance that’s caused by age is really starting to disappear in my family. I don’t know. If anything, I had fun and I was glad for the opportunity to spend some time with Aidan and am also glad that he doesn’t scratch me anymore.